Namine and her cousin attended a little fairy-themed arts and crafts festival over the weekend. It was super hot on Saturday. But all things considered, I’d prefer that to rainy. If I know my lore, fairies (or, if you’re proper, faeries) can’t go out in the rain anyway. Both Namine and her cousin wore their fairy wings and brought a wand. After making some art, we came back outside where it wasn’t quite as hot (and that’s saying something). 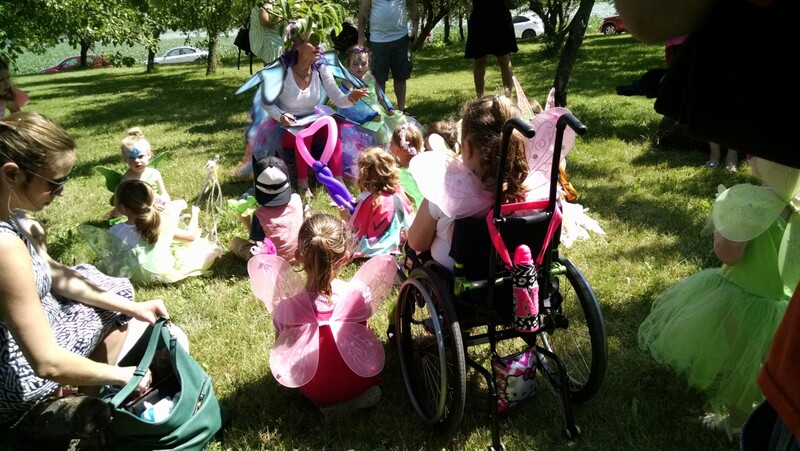 A woman dressed in her own fairy wings and face paint announced that she would be reading a story, so anyone who wanted to take part in Fairy Story Time should follow her. What fairy-loving child could say no? After story time was over, we checked with Namine’s uncle to see how the line was coming along. He was almost to the end of it, so Namine and her cousin took their places. When I asked Namine what she would like her face painting to be, she was very specific. She told the lady that she wanted a large rainbow butterfly, covering her entire face. At this point, we hadn’t yet exhausted the things available to do at Fairy Fest (although we were close), but we had exhausted our energy. We were all sweaty and a little tired, and we were all looking forward to some air conditioning. But before we left, the girls got to decorate their own cookies.